They're out! 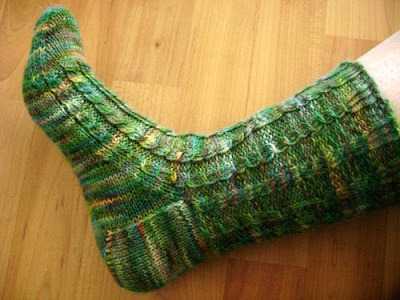 Pittsworth (Ravelry link) is a new, free sock pattern to comemmorate my move into Pittsworth Manor. Pick them up here on Ravelry, or here if you're not a Ravelry user. 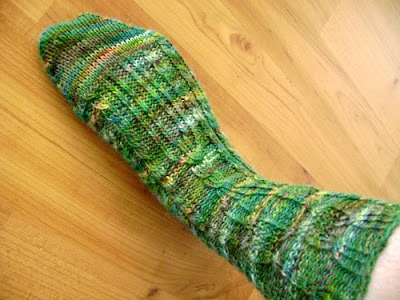 Cables work their way down these socks from cuff to toe, and have lots of fun in the process. They might look technique heavy, but they’re not! There’s just enough pattern there to keep one interested, and the foot’s chart is easily memorized. The pattern is a 5 page .pdf with large, bright pictures and colour coded (!) charts. These are kind of a sequel to the Naive socks (Ravelry link). I promise that you will like the write-up (and the heel) much, much better! It’s also a sort of prequel to Bavarois (Ravelry link), should you want to play with more fancy cabling. And now that this is finished and posted...I'm off to work on another new sock. Love it!! I have some gorgeous red semi-solid that could be perfect for this! April 7, 2009 at 11:21 a.m.
April 7, 2009 at 2:07 p.m.
Nice pattern!! And that yarn is FABULOUS! April 7, 2009 at 7:48 p.m. Thanks, lady! Would you believe that the colourway is called "Vegan?" April 7, 2009 at 8:37 p.m.
April 8, 2009 at 8:42 a.m. I am green over your studio possibility. April 8, 2009 at 4:03 p.m.
Lovely socks & thanks for the pattern. April 8, 2009 at 8:31 p.m.